Zuchex International brings the housewares sector – which exports to 206 countries - together for the 29th time at the Tuyap Fair and Congress Centre. Thousands of new designs - from table and kitchenware, glassware and electrical appliances, steel kitchenware, decorative furniture, home textiles, porcelain and ceramics, plastic homewares, lighting, to bath & kitchen accessories - will be exhibited at Zuchex 2018. With an expected attendance of 550 national and international companies, the Fair brings together the sector’s stakeholders. This year, the Fair will host the special event ‘Flavours in the Anatolian Style’, where some of the most prominent chefs, bloggers and food writers reinterpret local dishes. Renowned food writer Ayşe Tüter is in the kitchen on opening day! ‘Flavours in the Anatolian Style’ kicks off on September 13th, the opening day of the 29th Zuchex International Housewares, Gifts, Electrical Appliances Fair, with famous food writer Ayşe Tüter in the kitchen. She will be followed by business manager and cook Ahmet Can Aras, who will reinterpret selected dishes from Anatolian cuisine. On September 14th, the second day of the event, Deniz Şahin, one of Turkish cuisine’s reigning chefs, executive chef Umut Karakuş, and business manager Heyecan Şahin present their talents. Further expressing the richness of Turkish cuisine, famous blogger Sibel Yalçın, award-winning head chef Cihat Yaylakçıoğlu, and Ali Ronay, the founder of the Kitchen Guerrilla movement and a new generation cook, will discuss their personal experience of the local tastes of Anatolia. ZUCHEX International 2018 promises a delicious finale! On September 16th, the last day of Zuchex International 2018, master Chefs Umut Güner and Hüseyin Yılmaz, and food blogger Fatma Yağcı, will be in the kitchen. 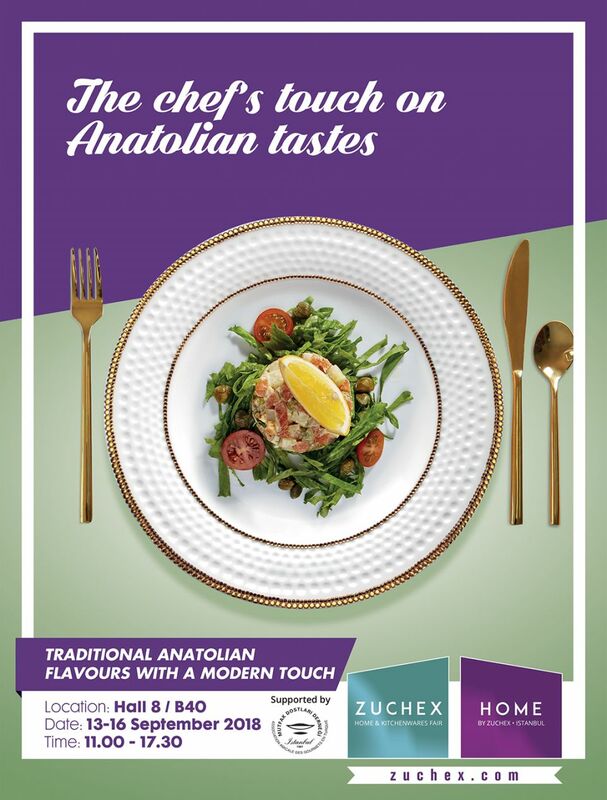 For more information on the ‘Flavours in the Anatolian Style’ event, hosted by Zuchex International 2018, presenting the latest trends across eleven halls at Tuyap Beylikduzu, please visit www.zuchex.com.